We make four different styles of Radiator Cover and this is the listing for the Shaker Style in standard measurements. 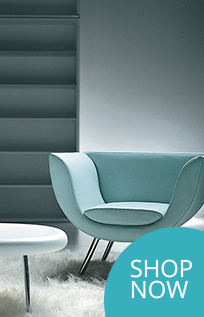 All our styles are made from sturdy 18mm MDF, and completed with your choice of robust grille. Standard cut out for skirting is provided on all styles, but you can easily enlarge this yourself for particularly high skirting. Each cabinet is supplied with all the fixings and is ready to assemble. All that is needed is a cross head screwdriver. Excellent quality and fixings make for a solid piece of furniture. All our cabinets are made here in our workshop on the Yorkshire Wolds. Circles - nice simple style. Slats - long horizontal slats. Baroque - fabulous ornate style. Diamonds - neat recurring pattern. Stars – lots of them! Fleur de Lys – elegant French style. 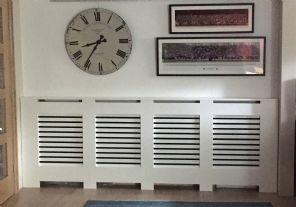 Cabinets can be made to different measurements, please see our made to measure radiator covers listing for a price guide or email for further information. Plain Unpainted, Primed or Topcoated? We have different prices depending on the finish you choose. The most economical option is plain MDF. This means that the radiator cover is sanded but otherwise unpainted. If you choose the primed option, the cover is sanded and treated with primer and then you can paint with your own gloss or eggshell. Primed and topcoated, like the primed version is sanded, and has been primed and then finished with a satin finish white paint. We try and get as perfect a finish as possible, but occasionally you may need to touch up some areas of the grille in the hard to reach places. © Copyright Wolds Wood All rights reserved.